Looking for a payments partner in China? As the UK and European international payment markets have become more competitive, many firms have begun looking towards new markets. One of the most common points of interest is China. Breaking into this market however is not easy – companies face stiff price competition, lack of brand recognition, a massive language barrier, and the need to navigate China’s currency controls and regulations. For many companies, the key to gaining access to this market is in partnering with an established company. Below, our local language team have mapped out the primary players. 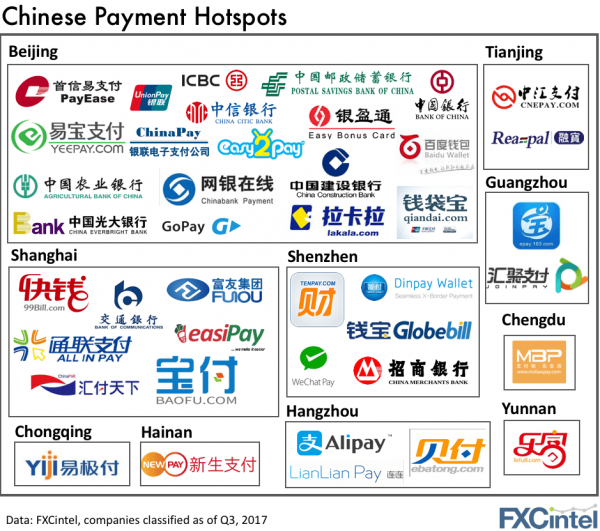 While Beijing and Shanghai are the most popular locations for company headquarters, some of the largest players (including Alipay, LianLian Pay, and WeChat Pay) are not based out of these major hotspots. To get a sense of quality of the partnerships and the need to work with a local market player, LianLian Pay has already provided a gateway for companies such as World First, eBay, Amazon, PayPal and Western Union has partnered with WeChat. Want to learn more about the payment industry in China, and how to make it your next growth market? Get in touch with us. In addition to analysing all the payment players across the globe, we also collect and analyze detailed information on the transfer fees and margins charged by banks across the UK, US, Australia, Canada, and several European countries. Our portal provides access to be able to benchmark the sector (banks and non-banks), market sizing, behavioural data and deep individual organization tracking. As our benchmarking chart shows above, bank pricing differs tremendously across markets meaning a totally different strategy is needed for the German market (very tight margins) compared to the US or Australian market for example (much wider margins).